It's officially fall in SF and I'm ecstatic! Aside from Christmas, fall is my favorite time of year! Crisp air, tall boots, pumpkin spiced EVERYTHING and most of all, comfy sweaters are the best reasons to love this season! So it comes to no surprise that my first post of fall is about a cozy sweater from Romwe! 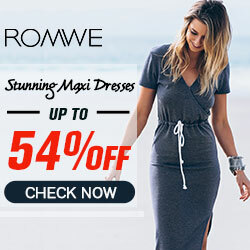 I partnered with Romwe to bring you the perfect outfit to carry you from summer into fall. Forget about "no white after Labor Day" and keep those white jeans out all year! There is nothing I love more than a winter white outfit, so why not a fall white one?! By pairing white jeans with this light grey sweater you're able to create a look thats half summer bright and half cozy autumn. The black accents are a nice touch to add depth to this already light look! ​Best of all? This sweater is on sale for only $19.99! Warm yourself up with those incredible prices!! ​With the fall chill finally here, head over to Romwe and warm yourself with their soft sweaters and amazing prices!